Brown Mamas' Blog Uncategorized What's Up at the Carnegie Science Center this Summer? All fun does not happen outdoors. While the weather is hot, and the sun is shining. Sometimes its nice to have a fresh and fun kid-friendly experience inside with air-conditioner. The Carnegie Science Center can turn into your backyard at the new BLUE exhibit or your swimming pool with the Great White Shark omnimax show. These two new exciting exhibits will have your kiddos using their brains and exploring worlds they never imagined right here in the City of Pittsburgh. As always, Pittsburgh Brown Mamas has teamed up with the Science Center to keep you connected to the funnest exhibits the city has to offer. Check it out! Description: Great White Shark is playing on Pittsburgh’s biggest screen at Rangos Omnimax Theater. Misrepresented, maligned, and misunderstood, the great white shark is an iconic predator: the creature we love to fear. Great White Shark explores this beautiful animal’s place in our imaginations, in our fears, and in the reality of its role at the top of the oceanic food chain. Great whites pre-date the dinosaurs in evolutionary history, and have evolved to regulate their body temperature and give birth to live pups, much like mammals. But we fail to look on them with the warmth we might afford land-based carnivores such as lions, tigers, and bears. Time & Location: Great White Sharks plays at various times at Rangos Omnimax Theater. Visit CarnegieScienceCenter.org for more information. Visit CarnegieScienceCenter.org for more information. Description: Use enormous blue foam blocks to build mini-cities! Be an engineer as you tinker with small and medium-size blue blocks – fun for all ages! Capture your silhouette on a giant screen, watch it fill with virtual blocks, then see the blocks come tumbling down! Time & Location: This exhibit is ongoing and is located on the first floor of Carnegie Science Center. Also, check out the BLUE! Performance Series with the Jimmy Adler Band on July 12th. Jimmy Adler puts passion and energy into every performance. The band’s music is a combination of blues and jazz. The Jimmy Adler Band has performed at regional outdoor festivals such as Pittsburgh Blues Festival and Carnegie Heritage Festival. 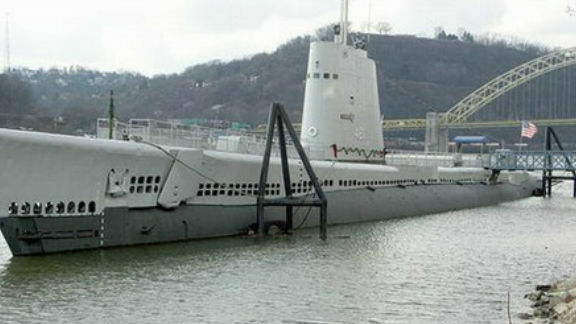 Description: Go behind the scenes of USS Requin with a Tech Tour. Learn how the submarine and its crew faced challenges. Explore un-restored compartments, and climb up the Conning Tower to see the periscope. If you’d like to know more about what’s going on at the Carnegie Science Center or its exhibits, visit their website by clicking here. See ya at the Center!